© DenLorsTools.com Summary: Applies to 2002 to 2009 second generation Trailblazers and Envoys with 4.2 Liter in-line 6 cylinders. This auto repair article is for GMC Envoys or Chevrolet Trailblazers when a P1281 fault code is scanned using a code reader or scan tool. The P1281 fault code is related to the engine not reaching operating temperature within the set parameter. More explanation of what the code means and suggestions on how to complete the repair much easier. Using any code reader or scan tool with OBD II capability is all that is needed to read and erase the fault code. The thermostat is NOT just to keep the engine cool, it also helps the engine heat up quickly to normal operating temperature within a certain time-frame. For the catalytic converter to operate at it’s highest efficiency the computer needs to be in closed loop. Closed loop means that the computer is in more control of fuel mixtures based on inputs from several sensors. Until the engine is running at the normal operating temperature, the computer usually controls the fuel mix less efficiently. That’s why it’s important for the thermostat to stay closed until the engine warms up quickly. If it stays open or opens up too quickly the motor will not reach the desired temp as quickly as it should. Most of the time when this code is retrieved, the t-stat is not working properly. 1/4″ swivel socket and extension pictured above used to start the bolts. The thermostat is located on the left side of the engine. After removing the driver’s front wheel the t-stat housing can be seen over the frame. A long 1/4″ extension and 10mm swivel socket makes accessing the bolts holding the housing much easier. Usually this thermostat comes with a new housing as well. The tricky part is starting the bolts back in when installing the new t-stat. It’s easy to drop the bolts before actually getting them started. 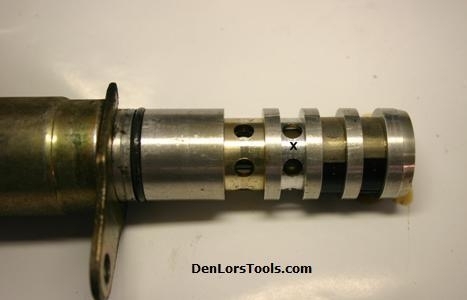 An old trick for holding bolts in place in hard to get to areas is to use small orings to act as a retainer. The o-rings are perfect for preventing the bolts from falling and are small enough to be collapsed when the bolts are tightened as to not cause any problems with the housing seating properly. To help hold the bolts in place small o-rings are used to prevent them from falling. 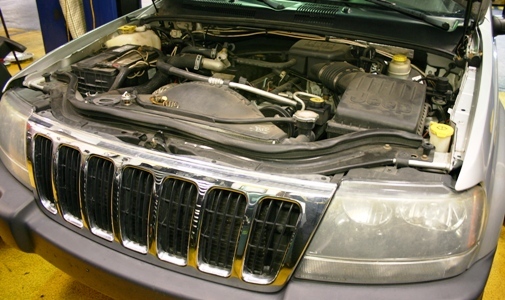 Once the thermostat is replaced and the coolant is refilled, the fault code can be cleared. Usually it’s best to run the heater when topping off the coolant to help remove any air pockets that may be in the cooling system. 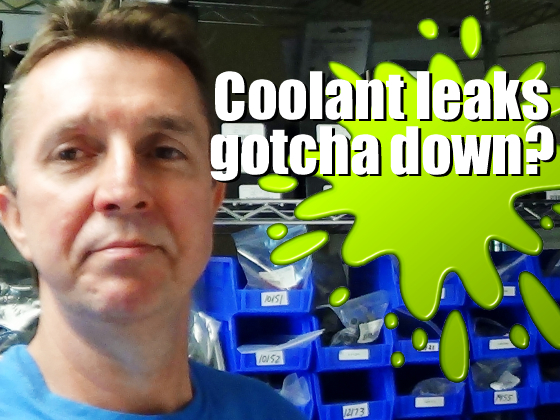 When the heat is blowing hot and the temperature is in the normal range the coolant level will be full. Hopefully this repair article has helped explain and answer questions about the P1281 fault code scanned with a code reader or scan tool. Be sure to check out the links below for even more information and specialty tools. Linking: Please reference this car repair article when quoting, linking to this page is welcomed and appreciated. If you are new to linking a page. 1. Left click the link; to highlight 2. Right click, select copy 3. Right click and paste to car forums, auto repair blogs, car repair web sites etc. Thanks! Disclaimer: Automobile repair tips are designed for informational purposes only, without warranty of any kind, in no event shall the author of this site be liable for any consequential, incidental or direct damages sustained in the course of using the repair information in this article. All rights reserved by DenLors Automotive Tools. Keep us in mind for auto tool needs, shop supplies and mechanics equipment.